Creative Comp offers new and pre-owned computers for sale. We build custom computers for your everyday use whether it be for business owners, graphic designers, video editors, gamers, database technicians or server technicians. We have the experience to build a computer to meet your needs. If its a virus, hardware failure, or need a computer upgrade we can troubleshoot your computer and get to the source of the problem in most cases. Creative Comp can repair your computer and fix any make or model laptop and desktop computer. With our on-staff Network Engineers, System Technicians, and Software Specialists, you can be confident that you are in the right hands when it comes to your networking needs. We provide you with solutions for Internet base business and website hosting needs. Our technicians have the ability to troubleshoot any issue, and make sure that your computer is running like new whether your computer has had a virus, is running slow, or has had hardware fail on it. Creative Comp is ready to help your business with setting up servers, networking PC's, developing a data storage system, recovery systems, and backup plans that will insure that your company will never lose all of its data. We can install your software throughout all of your machines too. We handle all of the latest smartphones and tablets. These include Apple Products, Samsung Products, Panasonic, HTC, Motorola, Sony, Blackberry and many more. Bring in your mobile devices today and we can inspect it and provide you with an estimate. If your network of computers were to crash you have to make sure that you have a backup plan in place to insure that all of your companies files are intact. Creative Comp can assist you in setting up backup plans, and making sure all of your hardware and software are ready to keep your data safe! With different trends in the industry it is hard to keep up with current web design methods. Creative Comp is here to create the website that will stand out on the web and work on modern browsers and devices. Creative Comp has been offering quality technical service to the greater Philadelphia area for over 10 years. We offer an extensive selection of services, products, and solutions for all of your technological needs. All of our technicians are highly experienced, professional, and friendly! 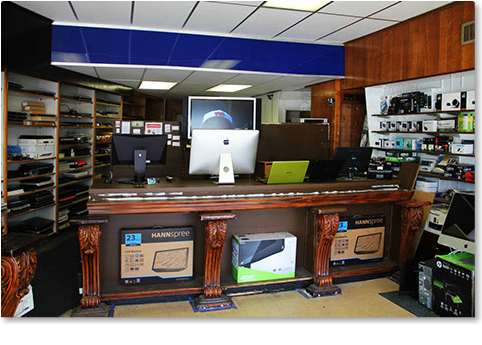 From computers and web design to pre-paid phone and wireless hot spots, our vast selection of electronics is sure to satisfy! As an established market leader in the Philadelphia region, we confidently assure our customers satisfaction with our products and services. No job is too small or large for us! We offer a wide variety of business solutions ranging from networking to data backup and recovery.